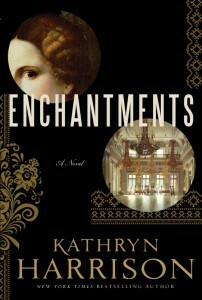 Earlier in the month, I tore through Kathryn Harrison's gorgeous, emotional, and captivating historical novel Enchantments. It had so many winning elements for me and it's a story I haven't shaken (and likely won't). 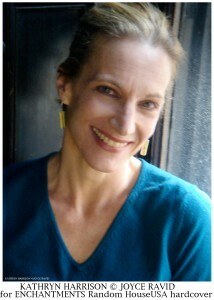 I am delighted to be able to share my interview with the author, Kathryn Harrison. Read on to learn more about her, her writing, Enchantments, and what she does when she's not writing. There's also another chance to win a copy of her newest book. I can't remember more than a few images from the short stories I wrote in college, but I do recall the one I included as my writing sample when I applied to the Iowa Writers Workshop. It's never been published, but it got me into the Workshop. I was 23 or 24 and more than a little overawed by Flannery O'Connor when I wrote it. The story was was titled "The White Bus" and it had a sinister, "Twilight Zone" quality. A man sets off on a highway, walking by himself, carrying no suitcase. He's followed by a white bus filled with what appear to be evangelical Christians en route to a tent revival. The bus keeps stopping, and the driver tries to get the man to board, which he refuses to do. In the end the driver of the bus runs the man over and carries his corpse onto the vehicle. The story has a more allegorical quality than anything I've written since, along with a resolution inspired by O'Connor -- the violent arrival of the Holy Spirit, which claims the man at the moment of death, the bus revealed as a supernatural conveyance, and the way to heaven a bloody road. The dark side of predestination. I work at a desk, on the largest mac available -- the 27" desktop. I'm nearly always at my desk at least an hour, and as many as three, before the rest of my family wakes up. I write nearly every day, and for as long as I can each day, unless circumstances prevent me. My children describe me as a workaholic, and I suppose they are right. Was Enchantments the original title of your book? Oh no, it probably had at least 10 working titles. A few -- "Handsome Alyosha" "Tickets to an Execution" and "The Window in the Egg" -- became chapter titles. The rest are scrawled on index cards, probably filed away with all the drafts of the novel. As you were writing Enchantments, was there a particular scene or character that surprised you? Yes: the turning point in writing this novel came after I had a complete first draft that I found disappointing. I'd written a fully realistic treatment of the period and felt flat to me: nothing transfigured or revealed in a new way. Straight realism was too small a container -- both for Rasputin and for the end of the Romanovs. While fretting over this I was paging through a book of photographs of the Romanovs, a "coffee table book" but it included text from various sources -- excerpts from letters and contemporary accounts of the royal family. One of these explained that Alexandra had been a happy, sunny-dispositioned child until her mother died, when Alexandra was 6, and from that time forward, the writer (I can't remember who) characterized the girl as being held captive under a dark cloud. I returned to my desk and wrote the scene that makes the metaphor literal. In the novel, Alexandra's cloud is visible, its size and color and tendency to rain all governed by her mood, which is mostly . . . rainy. The revised novel is filled with similar instances of something similar to "magical realism" -- an effort to infuse the narrative with the magic of folk and fairy tales. So there is the arrival of the devil and his entourage, the coronation scene with all the religious icons come to life, the magic motor car Rasputin"drives" to the Holy Land, and all the other instances of magic. I leavened a sad history and revealed it in a new light. I teach as well as write, and I have three children, so there isn't a lot of time left over. I love beach combing. Yoga. Spending time with friends. Going to the theater. Movies, too. I'm working on a biography of Joan of Arc, and for the past year almost all of my reading has been in service to that project. I've just finished The Waning of the Middle Ages by J. Huizinga, which was great, and very useful, and am now in the middle of William James' The Varieties of Religious Experience. It's the kind of reading I might do even if it were not research - up my alley so to speak. My thanks to Ms. Harrison for her time. Check out other blogs on the tour. I'm thrilled to offer a copy of Enchantments to one lucky reader! To enter, fill out this brief form. Open to US/CA readers, ends 3/23. Harrison sounds like a very interesting woman indeed, and I would have loved to read The White Bus! This was a captivating interview, and I had a lot of fun reading it. Thanks for sharing it with us today, and for the great giveaway! Ya know, I was kinda on the fence about this one. Seen it everywhere, but nothing yet told me that I wanted to really read it. Then I read the part about the coffee table book, and the cloud, and the magical realism. That hit it out of the park for me. Wow, Kathryn Harrison is an extremely impressive woman...at her desk writing up tp 3 hours before her family wakes up?! I wonder what time she goes to bed at night? And she has 3 children yet manages to write terrific books like Enchantments. I love her story about what she wrote for her application to the Iowa Writer's Workshop, it's so cool she was influenced in writing The White Bus by Flannery O'Connor. I'd love an opportunity to sit with and talk to Kathryn Harrison. This is a terrific interview, Audra, thank you to you and Mrs. Harrison for sharing it with us all! I still don't know how I feel about this one. I have a tendency to want to eat up any novel set in Russia, especially this time period, but I'm still on the edge for this one. I will add it to my TBR but probably a bit further down the list. The story she wrote for submission to the workshop is quite interesting!